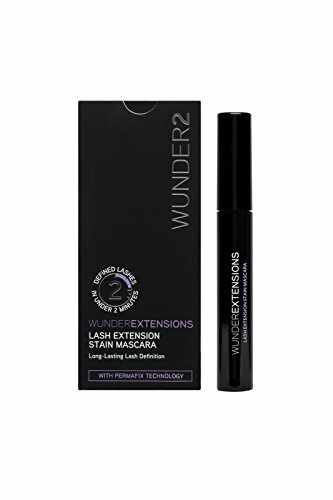 Introducing WUNDEREXTENSIONS Lash Extension Stain Mascara, this breakthrough lash stain gives you the lashes you wish you were born with - morning, noon and night - for up to 3 days of flawless smudge-proof, flake-proof wear. 72 Hour (3+ Day) Wear - Enjoy Defined & Longer Lashes for Days Without any Smudging or Flaking! Safe & Cost Effective Alternative to Lash Dying Procedures. Works as a Primer: Provides Extra Length and Volume when used as a Base to Favorite Mascara. To Remove prior to 72-hour Wear, use an Oil-based Cleanser or Waterproof Mascara Remover. Vegan and Cruelty Free Make Up. Made in Italy. Featured in About Time Magazine, Cover Media- MSN/ Yahoo, Refinery29, Yours Magazine, Brides. If you have any questions about this product by Wunder2, contact us by completing and submitting the form below. If you are looking for a specif part number, please include it with your message.